The University of British Columbia’s Okanagan campus will now compete at the highest level of interuniversity sport in Canada. An application for membership in Canadian Interuniversity Sport (CIS) for the men’s and women’s basketball and volleyball teams earned unanimous approval at the recent CIS annual general meeting in Victoria. The Heat teams were accepted into the Canada West Universities Athletics Association in May, pending this approval by the national body. UBC’s Okanagan campus has been officially welcomed as the 52nd CIS member institution effective September 2011. 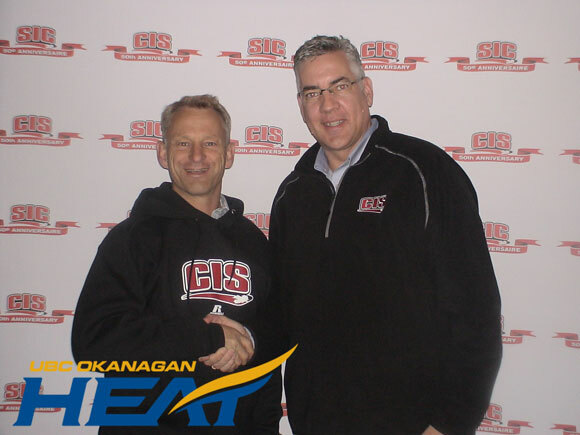 CIS is the national governing body of university sport in Canada. Fifty-two universities, 10,000 student-athletes and 550 coaches vie annually for 21 national championships in 12 different sports. Johnson credits several individuals within the university who supported UBC’s Okanagan campus in its bid to join to join CIS. These include Brad Bennett, former Chair of UBC’s Board, Doug Owram, Deputy Vice Chancellor and Principal of UBC’s Okanagan campus and Ian Cull, Associate Vice President Students. Owram says moving to this top tier of competition is yet another reason to cheer Heat teams on and he counts himself among fans. "Our Heat teams have enjoyed extraordinary success at the collegiate level in provincial and national competition, and we look forward to their future achievements," says Owram. "It will be very exciting for our community to see the Heat play teams from all of Western Canada’s major universities, including the Thunderbirds from UBC's Vancouver campus," says Owram. "We wish our student-athletes, their coaches and our entire Athletics Department the very best as they prepare for an historic first season as members of the Canada West division." The Heat will host the Thunderbirds in volleyball on the weekend of November 4th and 5th, while the basketball teams play the Thunderbirds for the first time at the War Memorial Gymnasium in Vancouver Jan. 27th and 28th, 2012.